Sorry I’ve been rather quiet lately. The reason for that is I bought a home towards the end of 2012. It’s a three-story townhome in the suburbs of San Francisco (I just couldn’t afford a standalone). What’s great about the place is that it’s a new construction, and within walking distance to some great shops and restaurants – something not many can say here in the suburbs. I’ve had the home for a little more than two months now, but I’ve been dealing with some flooring issues with the builder. Specifically, the laminate flooring was installed incorrectly so it had to be redone. That’s a story for a different time. So it’s time for some furniture shopping. But before I talk a bit about the furniture, let’s talk a little bit about the space. The space has a narrow, open plan with a living room, dining room and kitchen all on a single floor. The plan is to tackle the living room first. I’ve looked high and low for furniture at different stores, including Crate and Barrel, Room and Board, West Elm, IKEA, Mitchell Gold and many independent furniture stores – but found absolutely nothing that I felt was suitable for the space – and in my price range. Then I stumbled upon a blog about where to get mid-century modern furniture, and that’s when I found Canadian furniture store EQ3 and their only US store, right here in the San Francisco area. EQ3 actually offers a free design consulting service in which a consultant comes to your home to look at your space and suggests furniture. I actually requested the service and had someone come out and measure the space, and this was when I was introduced to the Byrd Sofa, which was definitely mid-century modern with a contemporary twist. I went to the physical store the following week and wanted to see the sofa in person – and it looked great. But somehow the sofa was just a bit too soft for my needs. This is when I found the firmer Reverie Sofa and the matching 1 1/2 chair, and I was sold. I got the charcoal fabric pictured below. 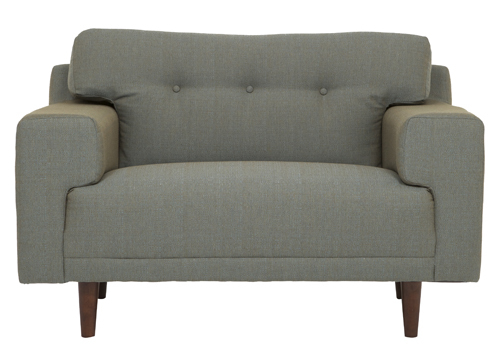 I then kept the Byrd 1 1/2 Chair as an accent chair, which I think would look great next to the Reverie. The in-store display also had this Boom Cocktail Table in walnut, which was perfect for my living room. The sides have pull-out drawers which would be great for storage – I love practical pieces like this. So why walnut? 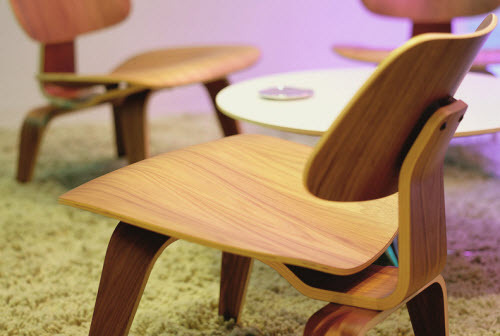 It’s to pair with the Herman Miller Eames Molded Plywood Lounge Chair I bought back in December. But there’s more. 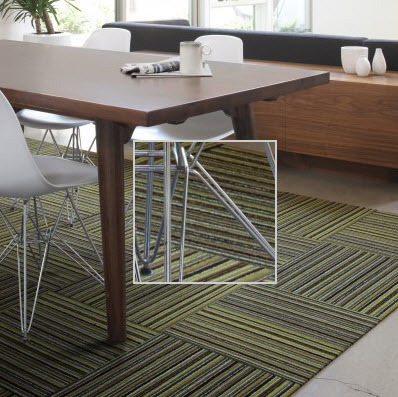 Rather than doing an area rug, I am thinking about placing these Sound Check carpet tiles by Flor in lime. Carpet tiles are a lot more easier to clean and deal with I believe. So this is the proposed furniture layout for the space. The one thing that is still outstanding is the media console for the living room. I’ll report when I do find something good enough to mention. As this will be a multi-post series, my next post about the home will be about the dining room dilemma. Stay tuned!